Carlyle Henshaw has been generous again and has shared his BlueJacket family research, this time about Blue Jacket Crossing. The three Bluejacket brothers that establish Bluejacket Crossing were George, Henry and Charles. Henry was my great-great-grandfather. The three brothers were grandsons of Shawnee Chief Blue Jacket, 1737-1808. He was the last principal war chief of the Shawnee Tribe of Indians. Carlyle explains, “My great grandmother, Emma Bluejacket, was born at at the Crossing in 1854. Her father was Henry Bluejacket and Henry was an older brother of Rev. Charles Bluejacket. Along with their older brother, George Bluejacket, the three brothers established Blue Jacket’s Crossing. 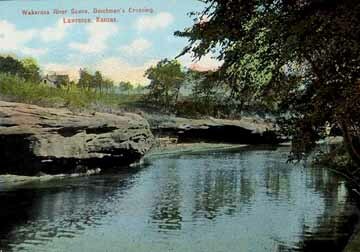 It was also called the Lower Crossing of the Wakarusa. 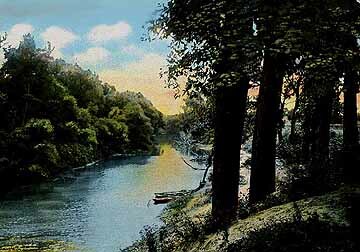 The Wakarusa arises in limestone hill country southwest of Lawrence, Kansas and flows east, passing that town just to the south of its city limits. About eight miles east of Lawrence, it empties into the Kansas (Kaw) River. The outcropping rocks at river level are the Haskell Limestone of Pennsylvanian geological age. These thick beds caused great difficulty for fording wagons. Emigrants needed to ford here to get out on the alluvial plain of the Kansas (Kaw) River, away from the limestone hills south of the Wakarusa. Thus, the reason for Blue Jacket’s Ferry operation at Sebastian, Kansas Territory, beginning in May of 1855. The Oregon California Road headed up at Independence, Missouri, which is south of the Missouri River and east of its confluence with the Kaw. Just after passing into Kansas Territory, it went by the Shawnee Methodist Mission, now in the middle of Kansas City, Kansas. About 35 miles west, the trail passed just south of where the Wakarusa emptied into the Kaw. 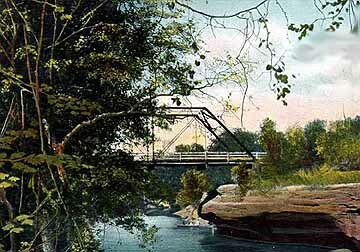 About two miles further west, travelers with wagons had to bite the bullet and cross the Wakarusa. 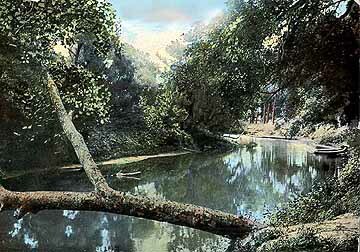 In May of 1853, wagoneers wrote of this small but formidable stream. Wagons had to be dismantled and lowered down the limestone beds, towed across and roped up the opposing bank. It was said that the Shawnee Indian, Paschal Fish, charged $5.00 to help in one of those operations. Although signed in May, the 1854 Shawnee Treaty was not ratified by Congress until November and Shawnee ferry operations at Blue Jacket’s Crossing were not initiated until May of 1855. Their installation would have had ramping on both banks to eliminate dismantling and roping and the ferry boat would have made passing a very quick trip compared with the olden days. Blue Jacket’s was an important point in its day, and as early as 1855 the legislature passed an act establishing a territorial road from Shawnee Mission Church, south, to Tecumseh, by way of this crossing. Two years later, the legislature of 1857 established a territorial road from Olathe on the Santa Fe Trail, on the most direct and practicable route to the crossing of the Wakarusa at Blue Jacket’s. This entry was posted in DNA, Shawnee. Bookmark the permalink.